Miniso has opened its doors to Bangalore in Phoenix Market City, and perfect for your minimalist aesthetic. From make up to kitchen wear and wallets and cute bags, budget paradise is here, y'all! 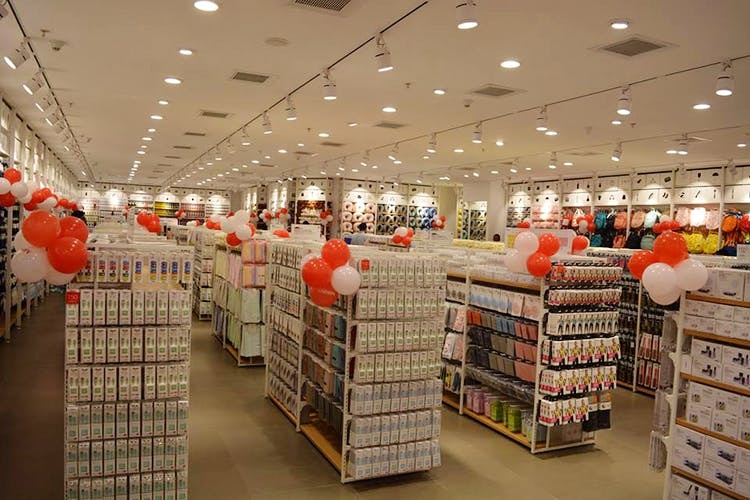 Less than a year after it opened its first store in India, Miniso has set up shop in Phoenix Market City to delight us all. It took us around two hundred hours to actually get to Whitefield, but we finally did and got our hands on some of the cute minimalist (and super reasonable) functional goodies that Miniso has to offer! The compact store has everything from stationery to household items to makeup, most of which is under INR 500! The most expensive item in the whole store was around INR 800, and it was a foldable storage unit. Their MO is to replace their stock at the end of every week, so expect a crowd (especially on weekends), but don’t worry, you’ll still find what you need. Products like storage boxes and pouches, bags, homeware, accessories and kitchenware are multi use, so don’t hold back with the “but do I need that?” reason. For makeup lovers always on a budget, cry tears of joy at their range of basic bath and beauty products (foundation, lipstick, eyeshadow/blush palettes and brushes, perfume, bath products, moisturiser, you get the gist). They also have massagers, hats and sunglasses, cute but basic umbrellas, and bags in colours that can be matched with any outfit. Their homeware section, though compact, has enough to fill your house and also has great options for those of you looking for on the go coffee cups, thermos flasks and sturdy cutlery. Travelling abroad? They have clear bags and travel containers for your shampoos and body washes as well as travel kits, neck pillows, fluffy blankets, ticket and passport holders and cute animal themed eye and face masks to stay on top of things and on point while on the go. Add a cute notebook, some pens and stationery and we’re sure you will be.